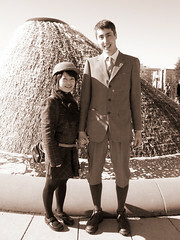 Here's a picture (courtesy of Eric Shalit @Tubulocity) of Hitomi and I at the start of the first Seattle Tweed Ride. The ride was mostly populated with your typical Critical Mass folk–early twenties, hipsters, people who flaunt traffic law–who had had raided Goodwill for clothing. And here I was in my expensive 3-piece suit from Hong Kong and Hitomi's outfit bought from Japan. Most (including myself) didn't really have much in the way of vintage bicycles but there were a few gems and intriguing setups. I wasn't very social but chatted with a few folk, including Eric. I didn't particularly care for the route. Still, the weather was lovely and warm and Gasworks was the perfect end to it. Gasworks is a pretty great place and very popular on weekends, but ironically appears to be the most neglected, in terms of landscaping and facilities. The place is full of weeds, the shoreline consists of concrete riprap and dead blackberry canes. This entry was posted in Uncategorized and tagged critical mass, gasworks, hitomi, seattle, tweed ride. Bookmark the permalink.